2. Cast away what’s holding you back. 3. Cheer up the brethren. 5. Cling to the anchor. 6. Continue doing what you know to do. 7. 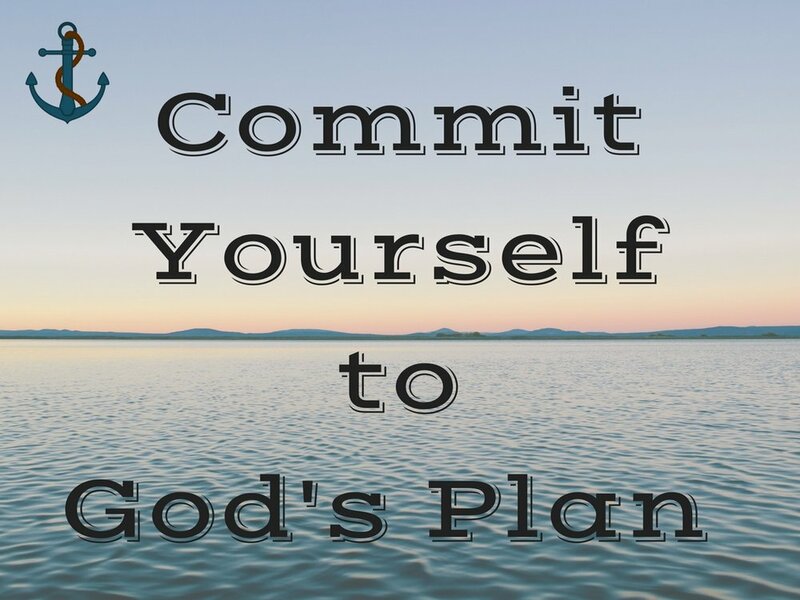 Commit yourself to God’s plan. 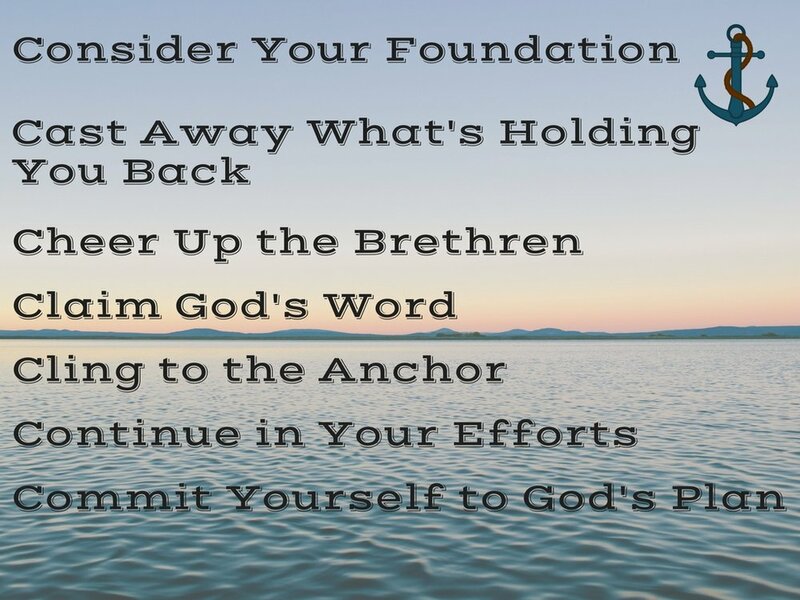 Following these guidelines doesn’t mean the storms will never strike, but it offers us the means to make it through, and that’s what I want to talk about today—making it through. Just as Paul had declared, the ship was destroyed, but no lives were lost. They all made it through though I doubt any of the 276 people aboard that ship planned on arriving in such a state. I guarantee you none of them planned on swimming or floating along on a piece of the ship. That was not how things were supposed to play out, but that’s life for you. Seldom does life give us what we expect. We plan for sun and get rain. We plan for retirement and get disease. We plan for financial freedom and end up with a boatload of debt. No, life does not work according to our plans, no matter how grand or sincere they may be. And that can cause major discouragement and disappointment. That is, until we change our perspective. We’ve established that none of these prisoners arrived on land the way they expected, right? But I ask you, how many of them, do you think, were complaining because they had to swim or float on a board? I’m guessing none of them because they were simply thankful to be alive. They made it to the shore, and at that point in time, it didn’t matter how they made it, only that they did! I’m reminded of the children of Israel during the Exodus. There was a direct route from Egypt to the Promised Land, but it wound its way through Philistine territory. The Philistines were a mean, warring people, and God feared if He led the people in that direction, the people would turn tail and run back to Egypt. So, He took them the long way around. The bad news is, sometimes God takes us the long way around—through the storm, across the sea, through the wilderness. Yes, sometimes the journey is long and hard, and it becomes difficult to stand fast. However, there is good news. For starters, we never travel alone. God is always with us, leading, guiding, and comforting. Plus, we have His promise that no matter what we face, we will make it through. It may not be when or how we expect, but we will make it to the other side of the storm, the other side of the sea, the other side of the wilderness. Through the waters. Through the rivers. Through the fire. We will make it through. Never doubt that and never forget it. No matter how much the storm is raging right now, it will pass, and you will make it safely to the other side. Your victory is guaranteed, so stand fast, me hearties and sail on. Comfort, Life's Journey, Sailing the Seven "C's"
We’ll get to today’s point in just a moment, but before we do, I want to point out something in verse 28. “And when they had eaten enough, they lightened the ship, and cast out the wheat into the sea.” Remember several days back when we discussed casting off the things that are holding us back? I mentioned that often the things we have to cast off are good things and that the casting is not a one-time process. This verse proves both points. After eating, they threw the food overboard. Food is definitely a good thing, but at this point, it weighed them down (no pun intended). And while they had already lightened the ship once, it was time for another “casting party.” I love it when God reminds us of and confirms His Word. Okay, on to today’s lesson. Notice the wording in the last verse, “they committed themselves unto the sea.” They had pulled up the anchors and allowed the sea to carry them wherever it would. The wind was in their favor. They saw a place where they might safely land the ship. But at this point, all they could do was pull up the anchors, commit themselves to the sea, and hope for the best. And sometimes in life, that’s all we can do, but we have an advantage, and I’ll get to that in just a bit. I’m certain none of these sailors, guards, or prisoners planned to arrive at the shore by these means. None of them expected to have a shipwreck. But we don’t always get what we plan, do we? You didn’t plan to be laid off from work, but it happened anyway. You didn’t plan to say “goodbye” to your precious loved one so early in life, but it happened. You didn’t plan to have health issues that hinder you from doing all the things you so want to do, but it happened. Plans are great but only when we realize that, ultimately, we are not the ones in control. We can make plans, but it’s up to God whether those plans will come to pass. He is the One in control, and His ways are above our ways. But we struggle with that, don’t we? We like our plans. We cling to our routines. We love expectations. Until the plans fall apart, the routines go crazy, and the expectations go unmet. Let’s face it, we set ourselves up for disappointment because we fail to commit our lives to God. We hesitate to say, “Thy will be done” because we feel, by doing so, we’ll lose control of the situation. But I ask you, are you in control of the situation now? Does anyone else feel like their brain is a never-ending spinning carnival ride? Round and round it turns with thoughts, ideas, plans, arrangements, schedules, and so much more. It’s exhausting and leaves us frazzled and weary. But according to the verse above, we wouldn’t have those spinning thoughts if we would commit our lives to God. If you study out the meaning, the verse is saying, “Turn your cares over to God, and your thinking is done for you.” We don’t have to figure out how to make things work. We don’t have to decide if Choice A is better than Choice B. No more fretting. No more sleepless nights. No more pages and pages of schedules that didn’t work out. It’s all in God’s hands, and all we have to do is follow where He leads. When He says “Go,” we go. When He says, “Stay,” we stay. And we can live out our days in peace, surrendered to the One who knows all things. As for the advantage we have over the sailors in our text, we are committing ourselves to One who loves and cares for us, One who has promised us good and not evil. Whereas, they committed themselves to the sea, which had not been friendly toward them. They had no assurance that the sea would be kind or that it had their best interest at heart. But, my friend, we have that blessed assurance. We can commit ourselves to God’s plan because we know His plan is better than anything we could ever ask for or imagine (Ephesians 3:20). We know He is on our side (Romans 8:31). And we trust He will work all things for our good (Romans 8:28). When all hope seemed lost, when they had done all they could do, the sailors were willing to abandon ship. Every man for himself! They were ready to quit. As far as they were concerned, they had tried and failed, so why bother to fight the inevitable? Fortunately, Paul was able to convince them to stay aboard the ship. I say he convinced them, but actually, he assured the soldier that the only ones who would survive were those who remained on the boat. As far as I know, this was the same soldier who was supposed to be guarding Paul and making sure the apostle didn’t escape. Ironic, huh? Anyway, the soldier evidently knew Paul well enough to trust him and cut the ropes holding the lifeboat, sending the craft crashing down into the storm-tossed waves. Wouldn’t you have loved to have seen the faces of those sailors? Confused. Irate. And likely hungry. According to Paul, these men had fasted for two weeks. Two weeks! It’s only been two hours since I ate lunch, and I’m already hungry. Two hours, not two weeks! Now, I will tread lightly here because I don’t want to be misunderstood. There is a time and place for fasting. The Bible makes that clear. So, please understand I am not condemning the practice. When God tells you to fast, by all means, fast. But with these sailors, this was neither the time nor the place. They were in a situation where they required sustenance. They needed strength. Paul knew that and told them as much. “Wherefore I pray you to take some meat: for this is for your health.” I feel like Paul was saying, “Hey, guys, it’s not over, so don’t quit living just yet.” And that, my friends, is the message for us today. It’s not over, so let’s not give up on life. Instead, let’s continue doing what we know to do. 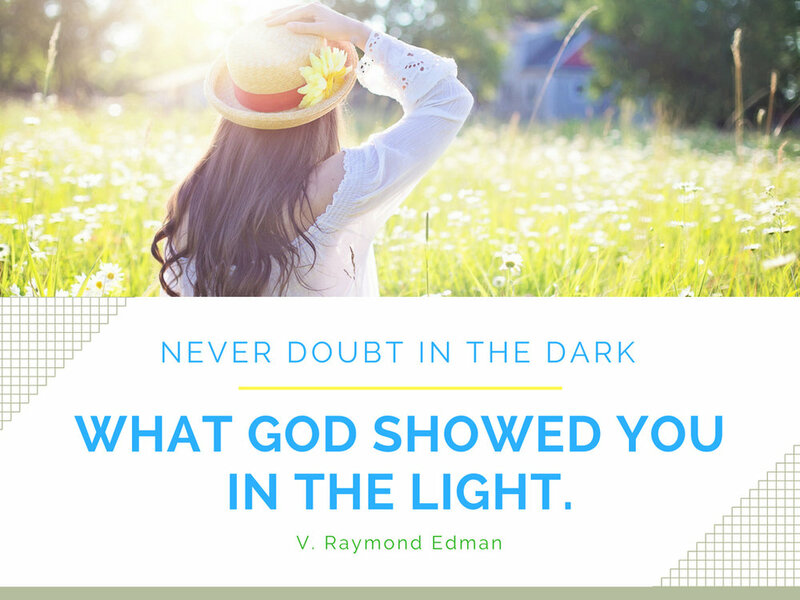 One of my favorite quotes is “Never doubt in the dark what God told you in the light.” During a storm, things can grow dark and confusing. It’s difficult to tell right from wrong, up from down, and even friend from foe. In the midst of a storm is the wrong place and time to make life-altering decisions, significant changes, or snap judgments. It’s not the time to try something new but rather to keep doing what we already know we’re supposed to do. Oddly enough, when troubles hit Christian people, so many pull away from their faith. They stop attending church, forsake their prayer and Bible reading, and even draw themselves into isolation. They quit doing all the things they know they should do and often go seeking answers elsewhere. Sometimes in a bottle. Sometimes in a one-night stand. Sometimes on a dark bridge in the middle of nowhere. The storm hit before they had established a plan, and when it did, their world fell apart. I won’t tell you it’s easy to keep on when every fiber of your being tells you to give up. It’s not easy at all! It’s difficult to continue doing the right things even when you know it’s the right thing to do. A storm is still a storm, and no part of it is painless. But as Paul told the sailors, you won’t make it if you abandon ship. Our only hope is to keep doing what we know to do until God tells us otherwise. The good news is He’ll give us the strength to do it. Remember, we’re not alone in the storm. He’s there with us, holding us, guiding us, encouraging us. We discussed in yesterday’s devotion how God would hold us when we don’t have the strength to hold on to Him. Well, He’ll also give us the strength to persevere. Don’t give up! I know the storm has been long and your strength is weak, but God will get you through this. 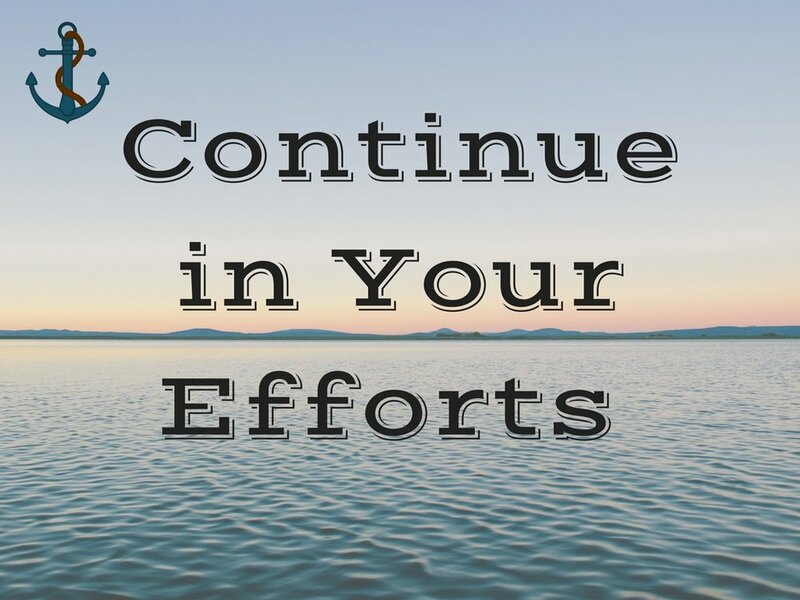 Just continue your efforts, and whatever you do, don’t abandon ship! Perseverance, Sailing the Seven "C's"